Refers to a method of slicing fruits, vegetables and meats into strips that resemble matchsticks. 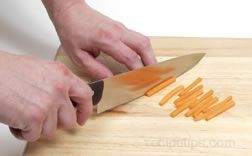 Julienne strips are usually no more than 1/8 inch (3mm) square, but can be cut to any length desired. Standard sizes are 1/8 inch (3mm) square by 1 to 2 inches (25mm to 50 mm)long. Fine julienne will be 1/16 inch (1.5mm) square by 1 to 2 inches (25mm to 50 mm) in length. Vegetables cut this way cook much faster, so julienne strips are often used in stir-fries. They are also used as a decorative cut to garnish various dishes. 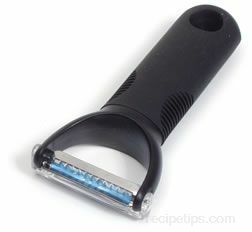 There are several kitchen utensils available to simplify the process, which are referred to as julienne peelers. These peelers typically have two blades, one straight-edge and one saw-tooth, placed perpendicular to the handle that serve to cut consistent sized strips as the utensil is run down and through the flesh of a vegetable or fruit.